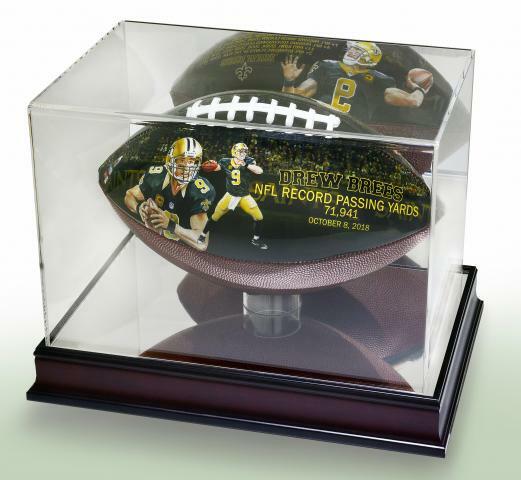 This product page is for the Drew Brees All-Time Passing Record Football and a Glass Display Case. 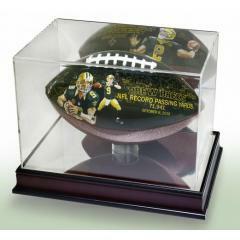 Note, the football and display case will ship separately. $10 for every football sold will be donated to the Brees Dream Foundation. Drew Brees has become the all-time leading passer in NFL history. With his 71,941st passing yard on October 8th, he passed Peyton Manning and is now in sole possession of this historic NFL record. To commemorate this incredible feat, BigTimeFootballs is proud to release this Drew Brees All-Time Passing Yards Leader Football. This full-size NFL football features two commemorative panels. One panel features the date of the passing record, and the yard mark which put Brees in sole possession of first place. The other top panel features the Saints’ logo and Brees’ career accomplishments. Both panels feature reproduced artwork of Drew Brees by noted sports artist, Jolene Jessie. This is a limited edition collectible that all Saints fans will want for their personal collections. Order yours today before they are gone! Every ball comes with a numbered certificate of authentication. This football is officially licensed by the NFL and NFLPA.